A retailer’s decision to purchase an Electronic Article Surveillance (EAS) system can seem to be a simple one. However, we have encountered many retailers who have made serious and usually costly mistakes. With a little knowledge and planning, an EAS system can be an excellent return on investment, simple to use and maintain. RF vs AM– There are two different types of systems on the market: Acousto Magnetic (AM) and Radio Frequency (RF). These systems operate very differently and do not work together although both technologies have been around for many years. Each has its pluses and minuses. Acousto Magnetic (AM) systems such as Sensormatic Systems have a robust electronic field that is not subject to many of the issues that RF has. You find AM labels on or in most everything you purchase in major retail stores as a result of Sensormatic’s Source Tagging Program. Although many previous AM systems required a 220V electrical power supply, most now are 110V which is a cost saving to the retailer. Hard tags and labels are robust and difficult for a shoplifter to remove without drawing attention to themselves. Radio Frequency (RF) systems such as Checkpoint Systems or Checkpoint Compatible Systems are also very good systems that have thinner labels and tags. Tuning these systems can be tricky and it is not a good idea for the retailer to do this themselves. System Quality– Like anything else in electronics, you get what you pay for. There are many knock off type systems out of Asia available. The problem with them is quality control in the manufacturing process, lack of good research and development and support. Many times these systems work for a short period of time and then break down. Lack of support or parts become an issue at that point. Small retailers have found themselves with a non-working system that has to be completely replaced. You should look for a 10 to 15 year life expectancy out of an EAS system. Yes, new models and features come along but a system you purchase should be able to go the distance. Remember, an EAS system is never turned off. It works 24/7. Make sure your selection is supported to go the distance. Warranty should be at a minimum 1 year. Support– Look into this in advance. Otherwise your support will consist of you on the phone with someone, while on your knees with a screwdriver making adjustments. Does the vendor have nationwide or even worldwide Techs in the field? This in itself says something for the manufacturer. Major Retailers like Walmart, Home Depot, Lowe’s…. are not interested in having their staff even tinkering with sophisticated equipment. It takes away from what they are supposed to be doing and ultimately the systems would not be working. In some cases we have seen that the “Tech” is a local sub-contracted Electrician. Electricians are generally very unfamiliar with low voltage equipment. It is not anything against a professional, licensed Electrician. They are highly skilled in high voltage but generally know nothing or very little about low voltage. It would be like asking a Railroad Engineer to fly a Boeing 747 (or the reverse). Probably not a good idea! Something else to consider: most new Sensormatic systems have the ability to be connected to your high speed internet connection. This allows Loss Prevention Systems, Inc. to do service remotely. In many cases this will eliminate an onsite service call and reduce your costs. New-vs-Used Systems– There are a lot of used systems available. What you have to ask yourself is where did they come from? This is not like buying a used car. With a car you can have it examined and see the wear and tear. Not so with EAS systems. Like I mentioned before these systems, once installed are rarely turned off. Most of the used systems you see come from two places. First, a store that has closed. So if the equipment at say a Home Depot store that is being closed and moved to a new location is in good enough shape, why would they not have it moved? It is probably because it is at the end of life or is somehow defective. These systems are sold to companies that remove fixtures from stores that are closing. They are not handled by Certified Tech’s and so the possibility for damage or the weakening of the electronics is likely. Companies then bring them in and “refurbish” them. This basically means that they take the parts from several systems and make a working system. Again, how good are these parts? On top of this the other possibility is that they are being sold by someone whose store has gone out of business. Again, ask yourself “Was this system de-installed properly so the very valuable electronic boards were not destroyed”? How long was it sitting on someone’s garage floor? Lastly think about warranty. New equipment generally includes full parts and labor warranties. Tags and Labels– Both AM and RF systems have labels that are placed on merchandise and are “deactivated” at your checkout. AM systems use a label that is thicker than an RF label. However, an AM label generally has a smaller footprint over an RF label. Certain RF labels can be printed on with your Thermal Transfer (TT) printer. You can print your barcode, logo, pricing, description or anything else you want. This in turn helps disguise and hide the EAS label form shoplifters. AM labels are not printable. Both AM and RF system labels can be defeated in certain ways. That is why hiding or disguising the label is helpful. Labels are “deactivated” by a deactivation unit at the point of sale. This “kills” the label so when the legitimate customer goes out with their purchases, they do not cause an alarm. Cheap labels tend to reactivate up to twenty percent of the time between the point of sale and the exit door. Hard Tags are the plastic tags that go on to mainly fabric type merchandise like clothing, accessories and shoes. Hard tags are always the best option to use if your product mix allows for it. Hard Tags are reusable and more importantly give off a stronger signal than any label. 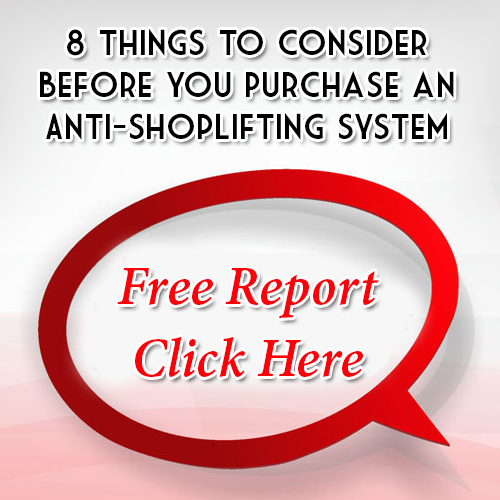 Training– EAS equipment will not solve your shoplifting problem alone. Many retailers I have worked with over the years have expressed dismay that they spent the money putting the system in and shoplifting did not decrease as much as they expected. You have to have a different mind-set and set your expectations correctly. The system is a support tool for you and your staff. Many times because of poor training and turnover of staff what happens is that a customer causes an alarm and the staff just waves them though. If that is what you are going to allow, then do not spend the money to put an EAS system in. Your training program should be two-fold: first – training on the system i.e. how it works, tag and label placement, what is a phantom alarm, when there is a problem what are they to do and so on. Second is antishoplifting training that has nothing to do with the EAS system. This training involves topics like approaching a customer that I am suspicious of and what can I say or do? What are the laws of my State? What are the policies of my company? And most importantly, how can I deter a shoplifter in the first place while creating a super environment for my good customers? Once you do that then you should see a considerable decrease in your losses. An ROI at about 3-5 months, if you follow this program would not be unusual. Again, ask yourself whether the vendor provides this type of training (we do with all system sales including unlimited follow up training) and has that level of experience dealing with shoplifters or do they just sell the equipment? An EAS system should be looked at as any other equipment or tool you need to operate and ultimately turn a profit in your retail store. It is as necessary to any retailer as freezers are to grocers or clothing racks to a ladies clothing store.